‘Flash flooding’ is flooding that only lasts between a few hours and a day and typically has very little warning. There are many causes of flash flooding, from the meteorological conditions that lead to the rainfall that cause the flooding, to the ground situation that results in flooding. Flash flooding is generally very localised, but can be very costly and result in significant disruptions. Flash flooding is due to intense rainfall that only lasts a short period – from less than an hour to a few hours. The amount of rain recorded over the course of the day may be low in comparison to rainy winter days, however the difference is that this amount of rain falls in perhaps only a few hours (Figure 1). The difficulty in forecasting such rain events is that the meteorological conditions that lead to intense rainfall are very small in scale. The predominant cause of hourly extreme rain is a convective storm, or a feature with convective elements. These are only around a few kilometres in size, smaller than the forecast resolution of any national weather centre’s weather forecast model. There may also be other processes, or other factors from the prevailing wind conditions to the orography, that will act to enhance the convective system. It is due to the small size of the meteorological processes that cause intense rainfall that make it so difficult to forecast. Once the rain reaches the ground there are also significant difficulties in predicting what will happen to all of the water. Outside of these hourly extreme rain episodes, we’re able to model how much of the water will be absorbed by the ground via infiltration and how much will run off the ground into rivers and drains (Figure 2). We’re also able to model the resulting changes in river flow from this over-land run off and water release from the ground. The natural (and man-made) systems are also able to respond to ‘normal’ rainfall intensities. During extreme rainfall it is a lot harder to model what will happen to the water. The ground is not able to absorb the water as quickly as it is falling, and other factors such as how wet the ground already is play a significant role. Therefore, it can be expected that the majority of the water will flow over the surface. This surface run-off is difficult to model and is highly dependent on the type of land use – in towns and cities tarmac and concrete surfaces will result in fast run-off speeds resulting in a rapid accumulation of run-off water in low-lying areas, e.g. under a railway bridge when the road dips (Figure 3). It may take only tens of minutes for the water to collect and exceed the drainage capacity. In rural areas there will be natural barriers, e.g. trees and hedgerows, however intense rainfall can still result in rapid increases in local river levels causing localised river flooding typically of natural floodplains, as the river is unable to get rid of the excess water quick enough. Figure 3. 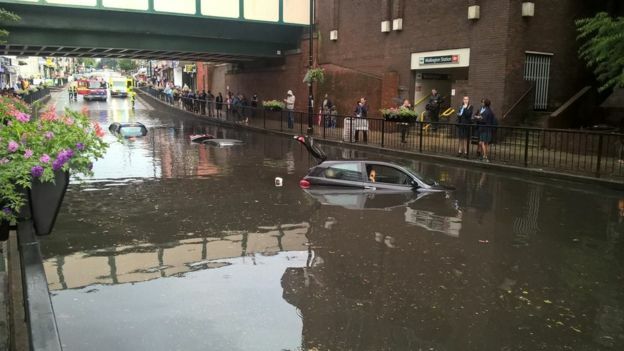 A recent example of flooding underneath a railway bridge in an urban area that would have accumulated quickly and took drivers by surprise – south London, 7 June 2016. Source: BBC News website, photograph credited to the London Fire Brigade. Due to the rainfall events lasting only a few hours, the flooding also only lasts a few hours as drainage systems, either natural (rivers) or man-made (drains), recover and move water further downstream. However, the speed at which the flooding occurs can often have large consequences due to the lack of warning or the speed and volume of water. We usually only see such flooding in winter as the convective processes that dominate the hourly extreme rain dominate in summer due to the stronger incoming solar radiation (it’s summer, it’s warmer). Such convective processes cause “summery showers” that last only a few hours, or sometimes minutes. 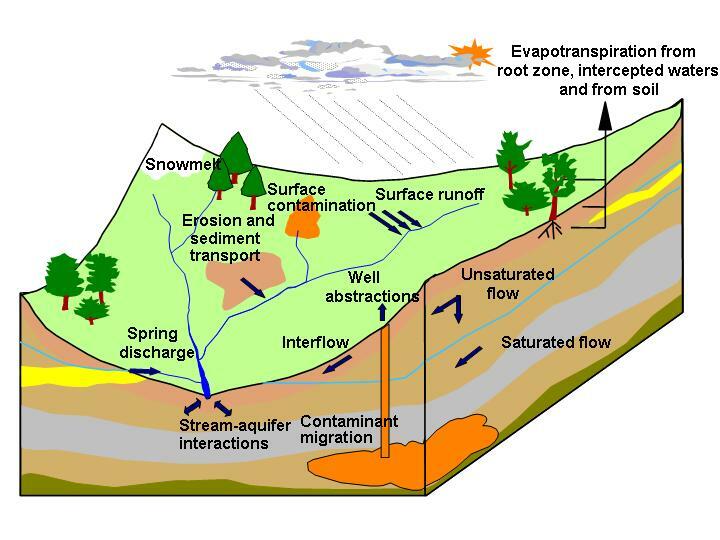 This entry was posted in Environmental hazards, Hydrology, Numerical modelling, Urban meteorology, Weather and tagged convective rainfall, flash flooding. Bookmark the permalink.